The newest resident of the New England Aquarium is a 21-pound, barnacle-covered bruiser of a lobster (Homarus americanus). The lobster arrived at the Aquarium Monday, July 23, from Capt'n Elmer's Fish Market in Orleans. The lobster is currently behind the scenes for a brief quarantine period. After a month or so, it'll find a cool new home in the Gulf of Maine exhibit. Today, the media was invited behind the scenes to meet the hefty crustacean. Senior biologist Bill Murphy introduced the lobster, explaining the difference between the lobster's claws: The crusher claw (top, in the photo below) is bigger and rounder, used to crush food such as shellfish; the smaller cutter claw is used to hold or tear prey. You can see several patches of shell disease on this animal's crusher claw, and the tips of the claws may have snapped off after being weakened by the disease. [Aquarium researchers are actively studying shell disease, common in local lobsters. Learn more here.] 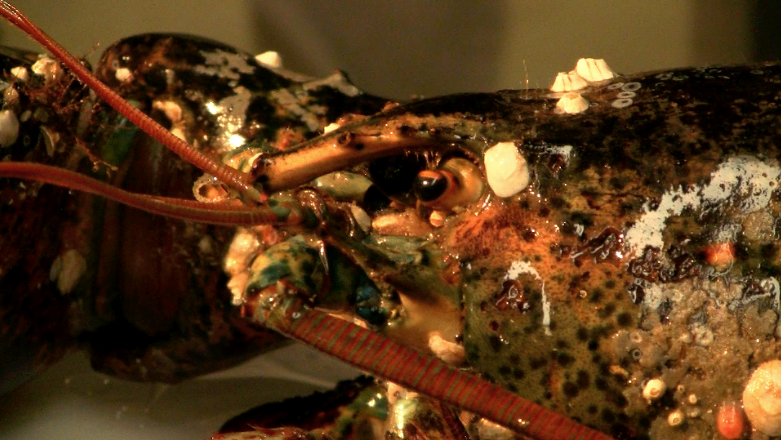 Murphy says the lobster will grow a full new shell after it molts, which may be a while. The unnamed lobster is settling in and eating well right now. When reporters wanted to know how the lobster got so big, Murphy responded, "Years of practice." He guesses the lobster is probably 20 or 30 years old. Because lobsters this size cannot fit in lobster pots, they turn up in fishermen's hauls less frequently. This lobster was caught off the coast of Cape Cod and landed in Capt'n Elmers Fish Market. The market held a fundraiser raffle to see who would have the honors of "releasing" the prize specimen. Proceeds went to the Dana Farber Cancer Institute. The anonymous winner donated the lobster to the Aquarium. Whether people are thinking about their bellies or they're just fascinated by these local crustaceans, lobsters are always big news around these parts. Check out these posts about calico-colored lobsters and one of the special animals used in Live Animal Presentation. Interesting! I hope that everyone had a great weekend,and I hope that they have an other great weekend! He/she is awesome! I'm so glad the winner decided to donate this wonderful crustacean to the aquarium.